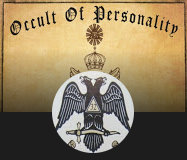 "With a focus on authenticity, accuracy, and quality, Occult of Personality peers behind the veil to provide recorded interviews with serious esoteric practitioners, scholars, and teachers from all over the world. Established in 2006, the podcast reaches several thousand listeners each month and has been noted for the quality and depth of interviews." > Listen in to the Occult of Personality interview here. 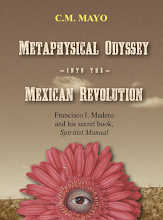 > More about my book, Metaphysical Odyssey into the Mexican Revolution, here. Is the Internet akin to a snowball in Beezlebub's back yard? The Archdruid speaketh. Why not make the most of your muffin tin? Plating junk food like high end cuisine because... one can (hilarious in an evil way). Nom Nom Paleo is now my favorite Palo Alto podcast. 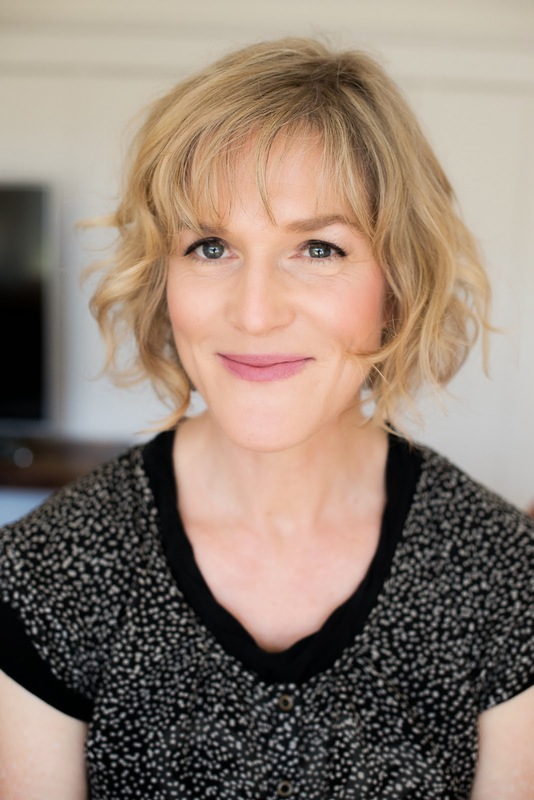 Artist, writer, farmer and animal rescuer Katherine Dunn is about to do something very special, sparklingly original and healing. Think of it as a combination performance art, pet therapy, and bibliotherapy. 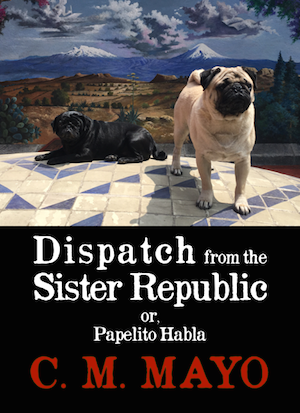 And yes-- my writing assistants approve-- it includes a handsome pug! 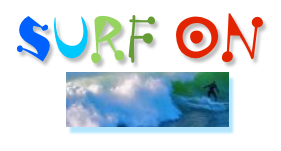 Check it out her page for this project at Kickstarter. 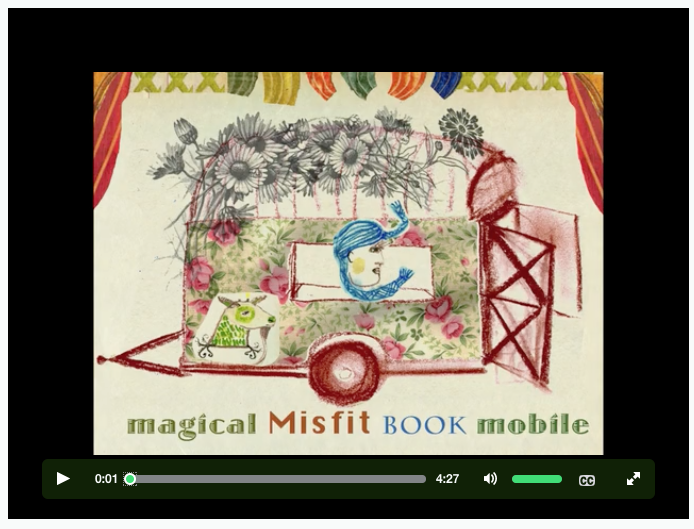 Watch the video (screen shot below) there as well. From my Conversations with Other Writers Podcast, a new transcript, from the 2012 interview with artist and writer Edward Swift. C.M. 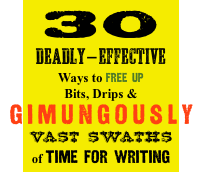 Mayo: Edward Swift is one of my very favorite writers. I didn't come across his work until fairly recently, however. 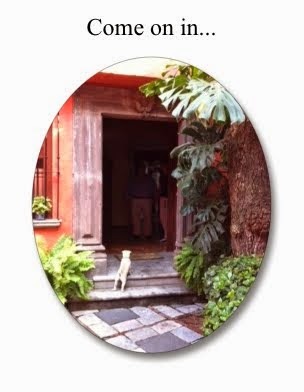 We met in Mexico City— I think it was in 2009— at an exhibition of our mutual friend, the Mexican painter Mariló Carral. Because Mariló went on about it, I got myself a copy of Edward's memoir, My Grandfather's Finger. 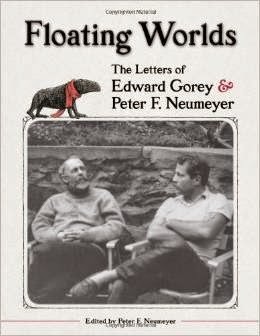 And I have to say, it was such a good read that every time the subject comes up I get ridiculously effusive, and I've recommended it to almost every writer I know, and lots of other people, too, and well— we'll be talking quite a bit about this very unusual memoir in the interview. 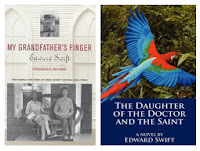 Edward is also the author of several novels: Splendora, Principia Martindale, A Place With Promise, The Christopher Park Regulars, Mother of Pearl, Miss Spellbinder's Point of View, and most recently, The Daughter of the Doctor and the Saint. I'm going to read to you a little bit from his website, edwardswiftartist.com. "Edward Swift made his debut as a novelist in 1978 with Splendora, which the Houston Chronicle praised as one of the year's best comic novels. He has since written five other acclaimed novels, as well as a memoir, My Grandfather's Finger. Of Splendora, The Washington Post says, "Splendora reads like an exuberant fairy tale about a young man's search for himself." And writing in The New York Times book review, Anne Tyler wrote, "Edward Swift has a particular gift for capturing the continuous low musical murmur of small town gossip. He knows how stories seem to grow on their own, drifting almost unnoticeably toward the mythical." And of A Place With Promise— which received glowing reviews from Publishers Weekly, Library Journal, The Boston Globe, and many others— in the Los Angeles Times Carolyn See (no easy customer, by the way), writes, "A Place With Promise is a dignified, stately, intelligent book, everything a novel should be." C.M. 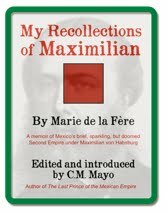 Mayo: It's the morning of February 22, 2012, and I'm in San Miguel de Allende with Edward Swift, and you might hear some chickens crowing, and children playing, and I don't know what. We have a lot of sounds going on here, and that's just the way it is. We're in his workshop by his house— and I'm going to ask a lot of questions about the house, because it has a great story. So Edward, I am so happy to see you! I am so happy to be here to talk to you! This is really a thrill and an honor. Edward Swift: Well, it's a thrill for me too. What in the world do you want to talk about? C.M. Mayo: What in the world do I want to talk about? You have so many books. You have so many books! The one I love the most is My Grandfather's Finger, because it's the first one that I read by you. And you have a new novel, The Daughter of the Doctor and the Saint. You have several other novels, Splendora, A Place With Promise, and other books. And you have such an interesting life. But let's talk starting with page three of the essay that you wrote for Gulf Coast. Edward Swift: What's on page three? I have no idea! C.M. Mayo: [Laughs] "Come In, Mr. Proust: Remembering Marguerite Young." This is one of the most beautiful essays by a writer about his mentor, about learning to be a writer, that I have ever read. Edward Swift: Thank you. Marguerite Young was very special to me. I sought her out. 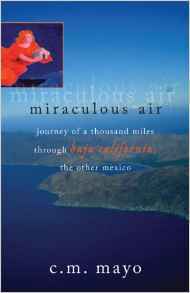 I read her book and it spoke to me, and I knew immediately that I had to not only know her, but study with her. C.M. Mayo: And you studied with her for a long time. Edward Swift: Four years in class at the New School for Social Research, and outside of the classroom we remained very close for about six years. And I met her for coffee almost every week, sometimes twice a week, down in the Village in New York in a little place called Reichert's, and then later on in a coffee shop called Pennyfeathers. And I was one of Marguerite's children until I was about 35 years old. C.M. Mayo: So this was in the '70s. Edward Swift: Yes, the early '70s. C.M. Mayo: Greenwich Village, New York City. C.M. Mayo: A very exciting time to be in New York. Edward Swift: Well, it was the very last of the bohemian period in New York. Bohemian life was still alive in the Village. Now it is not. It is far too expensive now for artists to be able to move into the Village, so it's become very gentrified and full of families, and Wall Streeters, and people with a great deal of money who can afford those old brownstones and old apartment houses that we used to live in that cost nothing. C.M. Mayo: And now they're several million dollars. Edward Swift: Now they're several million dollars. C.M. Mayo: [Laughs] You wrote in this essay that the image of the whale was of supreme importance to her. Quote, "To be swallowed up by the world and regurgitated, reborn with enlightenment, that," she said, "is the way of the artist. Some of you go into the whale but never come out again. Some of you go in and come out, but haven't the slightest idea you've entered another room. You walk through the door without seeing the portal." You've been an artist for many, many years. 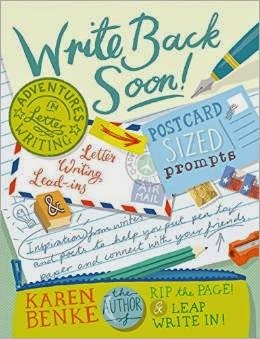 You have written book after book after book. Your know, most people want to write a book, and never write it. Or they write it, and then it's such a searing experience they give up. But you have kept at it, and kept at it, and kept at it, and you also make art. You really are an artist, decade after decade. Do you think it's being swallowed up by the whale? 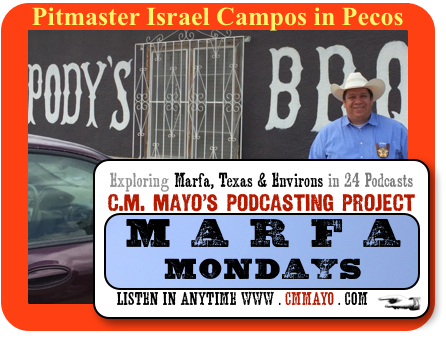 For the Marfa Mondays Podcasting Project: Exploring Marfa, Texas & Environs in Far West Texas, I have just posted #19, an interview with Israel Campos, the award-winning pitmaster and owner of Pody's BBQ in Pecos. Yes, Pecos is an hour and forty minutes' drive from Marfa. Never mind, go there, grab a plate of brisket at Pody's BBQ, and you will ring the bell! You can find all the Marfa Mondays Podcasts on my webpage here. They are all free; listen in anytime. There are now 19; there will be more until there are 24. These podcasts are apropos of my book in-progress about Far West Texas, that is, the blazingly gorgeous and utterly fascinating Trans-Pecos.